One of the best online casinos for players with substantial bankrolls. Great range of tournament action in many different formats. Fees apply to certain withdrawal methods. Ever since we were provided with a list of online casinos to check out and give our opinions on, we have been looking forward to compiling this Spartan Slots review. With over one hundred top-quality slot games, a live casino and a dozen more table, specialty and video poker games, players appear to have an incredible amount of choice. In addition to the fantastic range of games, the Spartan online casino offers some of the biggest casino bonuses and promotions we have seen among respectable online casinos. All of this would suggest an ideal venue for online gamblers. Was this the case when we checked it out? 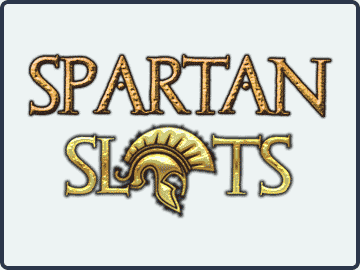 You will have to read the rest of our Spartan Slots review to find out! Spartan Slots is operated by the Deckmedia Group – a company with a long history in the online casino industry. The site uses three different software providers – TopGame, BetSoft and Rival – to provide as rich and entertaining variety of games. It also has a reputation for fairness, prompt cashouts and multi-lingual customer support. Whereas many online casinos operated by the Deckmedia Group are targeted towards mid-stakes recreational players, we would suggest that Spartan Slots is more a high-rollers paradise. For example, the site´s first deposit bonus has a cap of $25,000 and some of the tournaments have an entry requirement of a $1,000 deposit. One of the things we really love about the site is the quality of slot games available. All of the games can be played in “Practice Mode” before you take them on for real, and each has a “Volatility Rating” to indicate whether you are likely to win small amounts often or have a lesser chance of winning a huge jackpot prize. Although the name “Spartan Slots” would imply the casino is a slots-exclusive online venue, there is plenty of side action to keep players happy. You can play Roulette, Blackjack and Baccarat in the live casino, play different varieties of the same games via the table games lobby, or test your poker knowledge in the selection of video poker games. You have a choice of downloading the casino software on a Windows computer or playing in mobile-friendly “Instant Play” mode if you are using a shared computer or a Mac. Although the “Instant Play” version of the software is pretty good, we recommend downloading the full version of the software whenever possible to have access to the complete range of games. We mentioned at the start of our Spartan Slots review that the site offers some of the biggest casino bonuses we have seen. Although no limit is shown on the website, we checked with Deckmedia, and they told us the cap on first deposit bonuses is $25,000. There are two ways in which players can take advantage of this exceptional offer. If depositing by credit card or eWallet, the first five deposits each qualify for a sign-up bonus. The first deposit attracts a 200% bonus, the second, third and fourth deposits attract a 100% bonus, and the fifth deposit attracts a 175% bonus. If depositing by Bitcoin, your first three deposits qualify for a Spartan Slots casino bonus of 400%. However, please note the casino does not offer a Bitcoin withdrawal option at present (although we expect this to change in the future). Like most online casino bonuses, the bonus amount is used for staking your bets and any winnings are paid into your real money account. The first of each of the sign-up bonuses has a 75x playthrough requirement, which is a little high compared to many online casinos. Thereafter, the playthrough requirement is 35x the deposit and bonus amount – still a little high, especially considering a $10.00 maximum bet limit applies until you reach the higher stages of the VIP Club. In its favor, games played on non-slots activities do contribute to the playthrough requirements. The wagering contribution for video poker is 20%, for Roulette, casino war and mini-baccarat is 10%, and for Blackjack is 2.5%. Blackjack players will get better contribution percentages at other online casinos, but may wish to continue playing at Spartan for the fantastic tournament options. Once you have made your first real money deposit, you automatically become a member of the Spartan VIP Club. There are six levels to the Spartan VIP Club to ascend by earning VIP Points for playing at the site. As you climb the levels, you are rewarded with higher limits on cash and bonus withdrawals, higher bet limits, dedicated promotions and invitations to exclusive events. Some of the promotions are really worth qualifying for. There is a daily slots tournament with a cash prize pool of $15,000, monthly Blackjack tournaments with $21,000 for the winner, and a $200,000 “Clash of the Titans” VIP promotion each Tuesday, Thursday and Saturday. There are also daily reload bonuses for VIP Club members – some as large as 300% for deposits of $1,000 or more. Depositing in the cashier is quick and easy. Simply select your preferred method of deposit (most credit cards and eWallets are accepted as well as Bitcoin), enter the amount you want to deposit (min. $10.00, although you must deposit at least $25.00 to be eligible for any Spartan Slots casino bonuses) and press enter. The amount of your deposit and any associated bonus will be credited immediately. There are no specific Spartan Slots casino bonus codes to use. At present, cashout options are limited to bank wire, check and echeck. Each of the cashout options has fees attached (typically around $20.00) and can take up to a week to process. We noticed that there is no option for a check to be delivered by courier, and if you want to cashout less than $300 your only option is echeck. It is also necessary to verify your account before requesting a cashout. Customer support is pretty good, although only available by live chat and email. The guys manning the live chat service seem to know their stuff and should be the first place you head if you experience any problems using the Spartan Slots software or making a deposit/requesting a withdrawal. They are also very clued up on the terms and conditions of each bonus offer. With regard to fairness and player security, the software used on the site is tested for accuracy and certified for fairness by an independent auditor. SSL technology encrypts all transactions between you and Spartan Slots, and although the security measures can seem a bit over-reaching in terms of what the site asks for to verify player accounts, we understand why the measures are there. We questioned at the beginning of our Spartan Slots review whether or not the online casino would be an ideal venue for online gamblers and the answer is, it is going to depend on what type of gambler you are. If you take the time to read the terms and conditions of the bonuses, and understand the rules of the tournaments, you will probably enjoy your Spartan Slots experience. Top quality software in every department of the downloadable client. Incredibly valuable bonuses, tournaments and VIP Club at the higher levels. Fair wagering contribution percentages for video poker and roulette. Higher playthrough requirements than most other online casinos. Few withdrawal options with quite high minimum limits. No telephone support, although live chat representatives were good. For us, compiling this Spartan Slots review was quite a good experience. We were able to download the software, create an account and make a credit card deposit without any problem. We enjoyed playing the games while clearing the first of the sign-up bonuses and had no difficulty withdrawing our winnings. However, is Spartan Slots for everyone? Probably not. We feel, in order to get the maximum benefit from Spartan Slots, you have to dedicate money and time to playing at the site. If you do that, we are confident you will enjoy a superb online casino experience and probably a lucrative experience as well due to the impressive range of bonuses and promotions. Spartan Slots is certainly a site for high-rollers once you get above the $10.00 maximum bet limit. Players with lower bankrolls could find the site rewarding, but be sure to check out the each bonus´s terms and conditions first.